Although some Florida farmers have been destroying their crops (FOR SHAME), strawberries sure aren’t going to waste here. This incredible recipe comes from Hay Day Country Market Cookbook by Kim Rizk. From the subtle sweetness of the pâte brisée cornmeal crust, to the fragrant filling, this pie is perfect. Just try it and you’ll see. 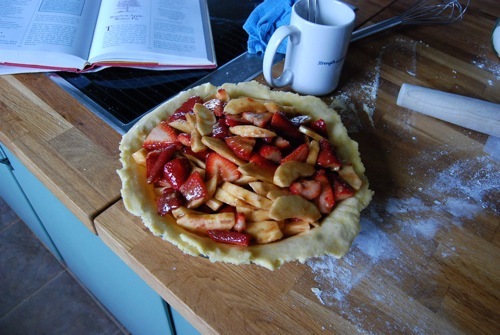 To make the crust, whisk together the flour, cornmeal and sugar in a large mixing bowl. Slice the butter into small pieces and add it to the bowl. 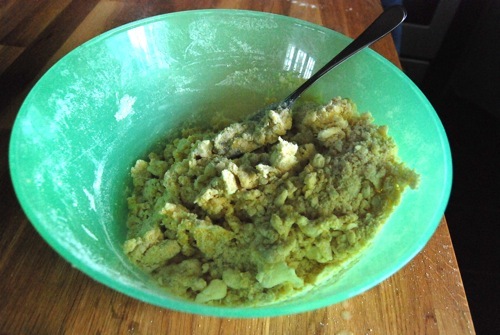 Cut the butter into the mixture using a pastry blender or your fingertips until the mixture resembles a coarse crumb. Separate the egg, setting the white aside for brushing the crust later. In a small bowl, whisk together the egg yolk and 3 T. water. Sprinkle this over the cornmeal mixture, working it through with the tines of a fork, until the dough can be brought together. 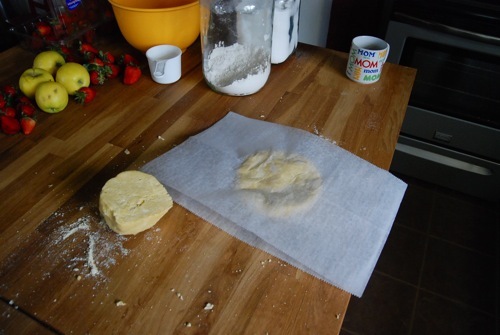 It will be very dry and crumbly; if necessary, add the remaining tablespoon water, (and any additional tablespoons, 1 at a time), until the dough can be packed together firmly with your hands. Knead the dough a couple of times in the bowl to form a solid mass. 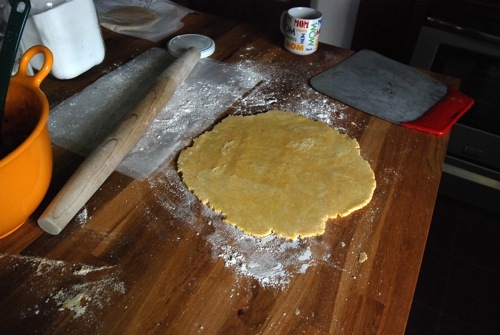 Divide the dough in half evenly. Using the heel of your hand, press each half out on a sheet of wax paper to form a 5-inch round. 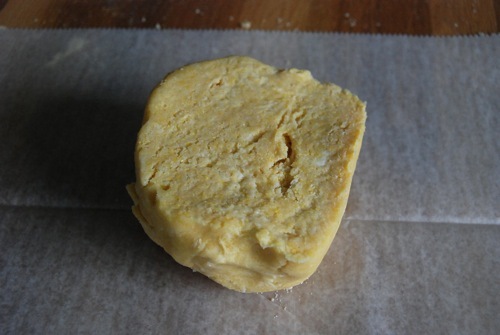 Cover and refrigerate 30 minutes, until dough is firm enough to roll and handle easily. Preheat oven to 350 degrees. Get out a 9-inch (preferably glass) pie plate and set aside. 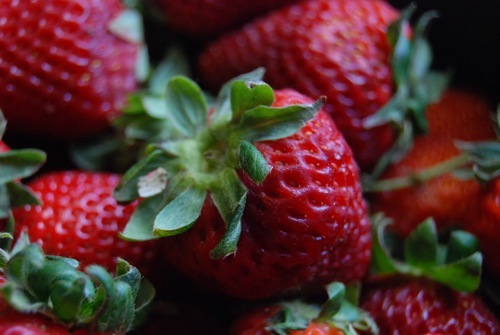 To make the filling, toss the apples, strawberries, lemon juice and vanilla together in a large bowl. In another bowl, mix together the sugars, flour, arrowroot (or cornstarch), cinnamon and nutmeg. Sprinkle this over the fruit, toss evenly to coat and set aside. Remove the chilling dough from the refrigerator, and on a lightly floured surface, using a lightly floured rolling pin, roll one half out to a 9-inch circle. Gently transfer dough to the pie plate and press down. Lightly beat the reserved egg white and brush it over the bottom crust. Spoon in the fruit mixture and any accumulated juices. Roll out the second ball of dough. You can keep it intact, or cut it into lattice strips to weave the top, if desired. 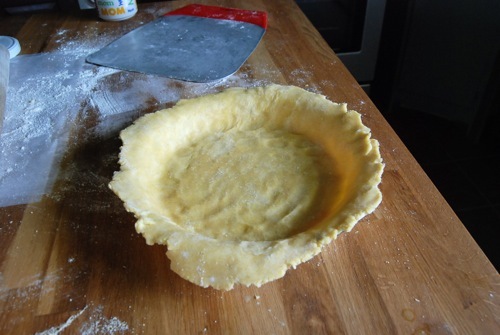 Either way, cover the pie with the top crust, then crimp edges to seal. Whisk the remaining egg white with the milk, and brush this wash over all exposed surfaces of the crust. 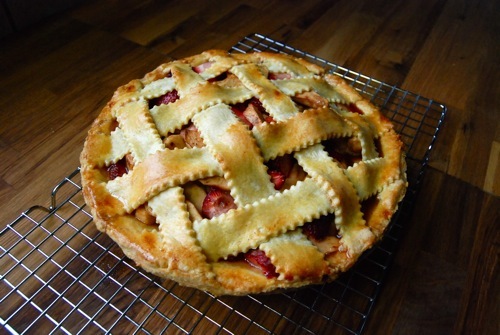 If the top crust is solid, remember to prick or cut small venting holes in to allow steam to escape. 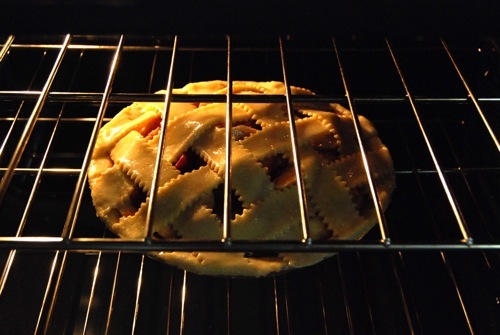 Place the pie on the middle rack in the oven and bake until golden brown, 45-50 minutes. This pie will be very bubbling and juicy, so you may want to place a baking sheet beneath it to save on mess. Once baked, remove from oven and cool thoroughly on a wire rack before serving.